The South of Rome includes the historic Appian Way and nearby catacombs, as well as important tourist attractions in EUR, and San Paolo. The EUR was built from the late '30s in a perfect Rationalist style in order to celebrate the 20th anniversary of Fascism (Mussolini became Prime Minister in 1922). The acronym once meant "Esposizione Universale di Roma" (Universal Exhibition of Rome) as the district was designated to host the International Exhibition of 1942, which never took place because of the war. After WWII, construction of the main buildings was resumed and the neighbourhood began to grow; the new authorities changed its name to that of "quartiere Europa", but the old name stuck. Today, this neighbourhood is the city's financial district. San Paolo is a residential area not so far from the center. Today it hosts several buildings belonging to the Università degli Studi Roma Tre and a very noticeable piece of art - the Basilica of St. Paul Outside the Walls, which certainly deserves a visit. For the rest, it is just a residential borough. The via Appia antica, or the Appian Way, was one of the earliest and most important Roman roads. It connected Rome to Brindisi, in southeast Italy, primarily as a route for troops and military supplies. The main part was started and finished in 312 BC. The original route can be followed for 10km or so, much with little or no traffic. It is lined with tombs and in places the original stones used for the road’s construction are exposed. The Appian Way passes close to three catacombs, the Villa dei Quintili and many other important architectural sites. If you are in Rome for a week or so, an exploration of the Appia, with a visit to some catacombs, is a great day out! Many photos of what can be seen are available at . The catacombs of Rome were used for underground burials. Primarily for Christian burials, they were also used for pagan and Jewish burials, either in separate catacombs or mixed together. Burials began in the 2nd century, due both to a shortage of land and for persecuted Christians to bury their dead secretly. 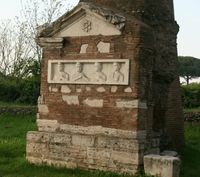 The Christian catacombs of San Callisto and San Sebastiano are on the via Appia antica and those of Santa Domitilla are nearby. There are also Jewish Catacombs. To reach the Appian Way from Colli Albani metro stop take bus #660 and get out at the last stop (Appia Antica - Cecilia Metella). From Termini station, take the #714 bus from the bus terminus outside the station, and change at the sixth bus stop (San Giovanni) to the #218 bus, which will take you all the way to the main entrance to the San Callisto catacombs and then on to the Santa Domitilla catacombs and the Fosse Ardeatine. The #118 bus, which leaves from Ostiense station and passes the Circus Maximus, will get you to the same entrance to San Callisto and then travels a further mile and a half along the via Appia. Beware that buses in this area are not very reliable, particularly in the morning or evening rush hours when journeys can be delayed or even arbitrarily cancelled. From the main sites of the Appian Way, consider returning to Rome with a walk through the Parco della Caffarella, which will bring you to the Metro line A. The Appian Way is theoretically closed to cars, but not buses or cycles, on Sundays and public holidays. Metro line B goes to EUR, with EUR Fermi being the most central station. The line also passes the Basilica of San Paolo fuori le mura, with the metro stop being named after the basilica. (See GET IN, above. The 118 goes to the catacombs of San Sebastiano before turning off the Appian Way. At the first major junction after Cecilia Metella (see below) by the bar you can catch the 660 (every half an hour traffic permitting) which will connect you with Metro Line A at Colli Albani station. A further two km along a pleasantly shaded part of the Via Appia, with many small tombs, and you arrive at Via del Tor Carbone. There you can catch the 765 bus (in theory every 20 minutes). West takes you to EUR and Metro Line B back to Rome at Laurentina station, while east connects you with Metro Line A. An alternative, although more expensive, trip is to take the Archeobus which provides a commentary in different languages.), . The Appian Way begins close to the Terme di Caracalla and heads in a south-easterly direction. For the first mile it is known as the Via di Porta San Sebastiano but after passing through the Porta di San Sebastiano it becomes the Via Appia. The first three miles are still heavily used by cars, buses and coaches but from then on traffic is very light and the wonderfully evocative road and its many ruins can be explored on foot or by bicycle in relative safety. 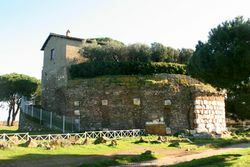 The Church of Domine Quo Vadis is on the second mile of the road by the main entrance of the San Callisto catacombs. Opposite is the office of the Appian Way Park (no. 60) where you can get lots of info and rent bicycles (09:30-17:30). From there it is rather dangerous to walk along the road for a mile or so as it is narrow with lots of traffic. 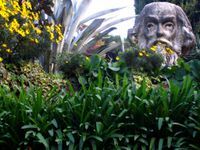 A more pleasant option is to walk parallel with the Via Appia, through the gardens of the San Callisto catacombs (except Wednesdays when they are closed). You can rejoin Via Appia at the third mile where, on the right, are the church and catacombs of St Sebastian. Opposite the entrance to the church is an 1852 memorial to Luigi Canina who supervised the restoration of the Appian Way under the orders of Pope Pius IX. Without Canina's work there would be little to see now. A little way further on the left is the Circus of Maxentius, the best-preserved chariot race circus in Rome. From there the road climbs slightly to the tomb of Cecilia Metella. After that there is little traffic and, for the fit, the road is straight and can be followed on foot or by bicycle for another four miles or so, with close to 30 small, mainly reconstructed, tombs to examine. Beyond Via del Tor Carbone there are some fascinating ruins but the trip is best done by bicycle as transport back is difficult to find. For lunch there are a few restaurants along the first few miles and a bar near the entrance to San Callisto. Opposite San Sebastian there is usually a mobile van selling drinks and panini. After Cecilia Metella is the somewhat expensive Appia Antica caffé, where you can also hire bicycles. The restaurant opposite does not seem very tourist friendly. There is a small, hardly noticeable, shop a little way further on the right hand side that sells snacks and drinks. Beyond that there is no source of refreshment without a detour, other than one water fountain and the occasional appearance of a mobile snack bar, both at the junction with Via del Tor Carbone. The attractions of the Appian Way are described here in the order in which they are found along the road, together with a few detours. Someone is watching you in the garden near the entrance to the Catacomb of St. Domitilla. The tomb of Cecilia Metella. The Original Surface. The lava flow from ancient volcanic eruptions in the Castelli Romani reached approximately to where Cecilia Metella is. The rock was used to construct the Appian Way. A few steps after Cecilia Metella the original stones have been exposed for about 30m. There are further lengthy stretches of exposed stone about 500m further on. In parts of the later stretch you can see grooves made by Roman carts. Excavations at "Capo di Bove"
Casal Rotondo and further. Casal Rotondo is the biggest mausoleum on the Appian Way, at about the sixth mile. It now incorporates a small private villa. It is not known for whom it was built. Immediately after Casal Rotondo you can take a left into Via di Casal Rotondo. A short walk down the hill will bring you out at Capannelle, Rome's horse racing course. From there you can take a bus to Metro line A, and back to Rome. For the really fit you can carry on a further three miles or more. At the 8th mile are some ruins originally thought to be part of a Temple of Hercules built by the Emperor Domitian, but now considered to have been more likely a place of rest, or even a factory. Shortly after that is a strange building known as the Priest's Cap because of the shape of its roof. From here it is a short walk to Ciampino Airport from where you can make your way back to the center. 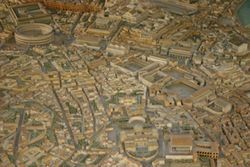 Model of Ancient Rome, showing the Colosseum and the Forums. Green Mobility Rome – Via Eurialo 23 . Telephone +39 3208427668 or +39 3356114502. The Green Mobility offers eco friendly cars, scooters, bikes, segways and shuttle service to Ciampino, Fiumicino and Civitavecchia Port. Le Bistrot , Garbatella - Via delle Sette Chiese 160, +39 6 5128991. Creative French and vegetarian cuisine with a very kind staff and a homey environment. Better to reserve. Sapore&Arte, Via Efeso 24/26 Metro B San Paolo Basilica, Tel. +39 6 59600340 Really good and fresh food, this place is run by young people who make extensive use of fair trade food. They have very good dressed potatoes and salads, bruscetta and sweet cakes. Mid-range at lunch and cheap at dinner. Don't miss it if you visit the nearby Basilica of San Paolo fuori le mura. If you plan to spend most of your time exploring the centre of Rome, hotels in this area may limit your options and involve you spending rather a lot of time on public transport except for places located near a metro station which connect you fast and easily to the city centre. Martini Bed – Via dei fulvi, 67 - 00174, Rome, Italy  Metro A Porta Furba Quadraro - Telephone +39 06 83088202. Guesthouse eco & bike friendly with single, double, twin, triple, quadruple and quintuple rooms. Private or shared baths, shower, self-service breakfast included, self catering kitchen, private parking. Double rooms starting from 60 Euros. Alba Hotel Rome – Viale di Torre Maura, 81 - 00169, Rome, Italy  Telephone +39 06 2678907. Three star hotel with double, twin, triple and quadruple rooms. Private bath, shower, breakfast included, meeting rooms, private parking and garden. Double rooms starting from 80 Euros. Hotel Arcadia Rome – Via Campo Romano, 75  Telephone +39 6 72672696 • Fax +39 6 72631647. The Arcadia is three star hotel which presents a wide range of double bedrooms with private bath, satellite TV, air conditioning, shower and breakfast included. Also available an internet point, gym and free shuttle service. Excel Hotel Ciampino Rome , Via Appia Nuova, 160. Telephone +39 6 935 41170/40021, Fax +39 6 935 42041/40021. Four star hotel just south of Ciampino Airport with 76 bedrooms of different size, private bathroom, spa centre, business services, restaurant, free shuttle to Ciampino airport and breakfast buffet. Double €53, triple €59. 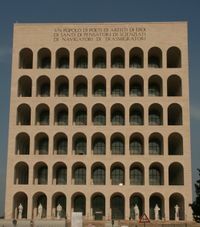 Hotel Santa Maura 2 Rome – Via Casilina, 1038, 00169 Rome, Italy . Telephone +39 06 2326 7630 • Fax +39 06 2326 7634. Single, double, triple and family rooms with private bath, free wi-fi, TV and air conditioning. Rates: Single €47-€70; Double €51-€175 with breakfast included. Tuscolana Hotel Rome – Via Tuscolana 185, 00182 Rome, Italy. [http:// www.hoteltuscolana.com] Telephone +39 06 7022653 • Fax +39 06 7010965. Private bath, shaver, satellite TV, wi-fi access and air conditioning in the bedrooms. Other services available: breakfast included, reception h24, reading room and bar. Double and twin rooms: 69 Euros. Warmth Hotel Rome – Via Giuseppe Prezzolini 5, 00143 Rome, Italy . Telephone +39 06 501 4599 • Fax +39 06 488 5270. One hundred bedrooms with private bath and shower, breakfast included and free Wi-Fi. Rates: Single N/A; Double €44-€156. 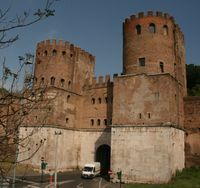 Castelli Romani. Continuing southeast from the Appian Way brings you to the Castelli Romani, including the Pope's summer home of Castel Gandolfo and the wine-producing town of Frascati. Ostia. Continuing southwest from EUR, Ostia is about 25km from the center of Rome. It's considered the capital's beach and is also well-known for the "Tourist Port" with moorings for boats from 8 to 60 metres in length. Don't miss Ostia Antica, the well-preserved ruins of the Roman port. See the Get Out section of Rome for more suggestions. This page was last edited on 14 January 2019, at 20:17.